Lobelia: The Intelligent Herb is only available to members of Steven Horne's Member program. 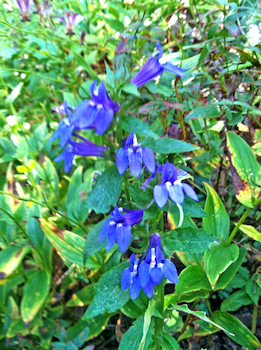 Lobelia is one of those herbs that some people call a panacea (a cure for everything). It was the number one remedy of Samuel Thomson, considered by some to be the father of American herbalism and famous herbalists like Jethro Kloss and John Christopher have extolled its virtues and used it extensively in their healing work. And, while it isn’t true that lobelia can cure everything, it has so many uses that no home should really be without it. Lobelia belongs to a class of herbs known as antispasmodics, which means it relaxes muscles and relieves spasms. This aids the flow of blood and lymph to every part of the body, which may explain it’s wide applications. Besides being used to ease cramps and spasms, and relieve pain associated with tense muscles, lobelia has been used for respiratory problems like asthma, whooping cough, and laryngitis. It has also been used to relieve earaches, tension headaches, childbirth pain and insect bites and stings. It has also been used for nervous system problems like epilepsy and convulsions. Large doses induce vomiting, but small doses ease nausea and vomiting. It helps reduce high blood pressure, promote lymphatic drainage, and shrink swollen lymph nodes. Join us for this month’s Herbal Hour and learn all about this amazing plant, as well as the uses for a few other major antispasmodic herbs.